In Japan: Radioactive Leak Stopped; New Steps Taken To Prevent Explosion : The Two-Way Workers used "liquid glass" to plug one route that contaminated water was taking on its way to the sea. Now, they're pumping nitrogen into a reactor vessel to keep hydrogen there from exploding. 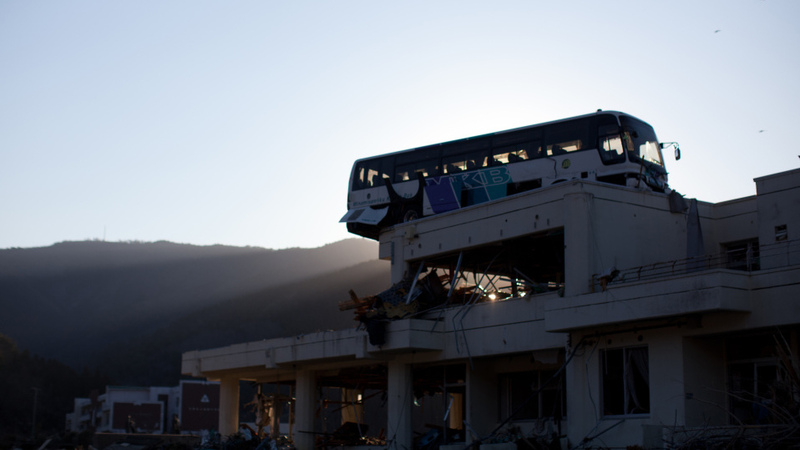 A destroyed bus still sits on a roof of a building in Ishinomaki, Miyagi prefecture. It settled there after the March 11 tsunami that swept over the coast. From Tokyo, NPR's Joe Palca tells our Newscast desk that Tokyo Electric Power Co. used "liquid glass to stop at least one route the contaminated water was taking" from the Fukushima Dai-Ichi plant to the sea. At the same time, though, "the company continues to intentionally discharge mildly radioactive water from storage tanks at the plant" so that those containers can be used to store more highly contaminated water, Joe says. As for the push to prevent more explosions at the plant's crippled reactors, Joe says that workers are injecting nitrogen into a reactor vessel because that should work to prevent an explosion of hydrogen that's building up there. NPR's coverage of the crisis in Japan, where a March 11 earthquake and tsunami devastated much of the the nation's north-central coast, is collected here.